"Match 31 and all associated Intellectual Property is owned solely by Money$uit Industries, LLC., and is used with permission by the owner on this website." The casino game called Match 31 is a table game where players are dealt two hole cards face down. Two community cards are also placed on the table where all players use one of the two cards to complete a three card suited hand. The objective is for players to combine a three card suited hand with a point value of 17 or higher in order to win. The playing card point values are scored as in blackjack: 2 through 10 are face value, Jack, Queen, King are worth 10 each, and Aces always count as 11. The players hand point values are matched to a pre-determined pay table. The dealer does not play. There is also an optional Money$uit Second Chance Bonus Wager where each player will have the option of placing an additional wager which the players can place to have the chance to make a second three card hand with the players original two hole cards and the Money$uit card. Players must first make an ante wager. The optional second chance bonus bet is also made at this time. Players receive two hole cards face down. After reviewing their cards, players must decide to either fold or play. Folding forfeits the play and ante wagers. The play bet must be equal to the ante. Two community cards and one Money$uit card are dealt. Ante pays even money if the play bet wins. The house edge for the base game is about 2.38%. The edge for the optional Second Chance bonus bet is about 2.75%. 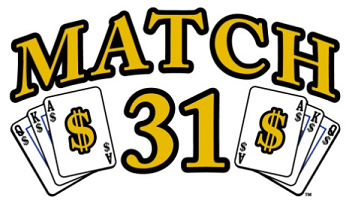 For more information about Match 31 and two more related games, 31 Classic and Money$uit 31, visit www.moneysuit31.com, where you can practice some free play on the game demos’.